A vial of a compound inside a lab at the Broad Institute of MIT and Harvard. Sajni Chakrabarti’s parents were staggered when doctors at Boston Children’s Hospital told them that the 7-year-old girl’s puzzling symptoms — several falls, trouble moving her pinky finger while playing the violin — were caused by a rare and malignant brain tumor. And there was little anyone could do to help. Surgery wasn’t an option because of the tumor’s location, and no drugs had been approved for the Cambridge girl’s deadly cancer, which is diagnosed in about 300 US children every year. “Here in a city where there’s so much research and such a great hospital, it was beyond devastating,’’ said her father, Prabal Chakrabarti, a senior vice president of the Federal Reserve Bank of Boston. “It was unbelievable.” Last July, 19 months after her diagnosis, Sajni died. Every other day, it seems, scientists discover wondrous new drugs. But some disorders — including rare pediatric cancers — still draw scant interest from drug makers in search of larger markets, and have no medicines available to counter them. Now, researchers at the Broad Institute of MIT and Harvard have come up with a novel idea to try to change that. It’s not unusual for researchers to find a new use for an old medicine. Thalidomide, a morning-sickness drug withdrawn in the early 1960s after it caused birth defects, is now used to treat multiple myeloma, a blood cancer. Sildenafil, first developed by Pfizer as a possible blood pressure drug, became the blockbuster impotence medicine Viagra in 1998. Leukine, which was approved in 1991 to bolster immune systems weakened by chemotherapy, was OK’d in March to treat radiation sickness in case of a nuclear explosion. The Chakrabarti family, from left: mother Vanessa Ruget, daughter Sajni Chakrabarti, father Prabal Chakrabarti, and younger daughter Anandi Chakrabarti. But researchers at the Broad say the Drug Repurposing Hub will be home to the largest collection of medicines ever assembled to find new potential uses. And because many of the drugs already have the approval of the Food and Drug Administration, they could get to market much faster than a medicine developed from scratch. Drugs typically take a decade or more to win FDA approval — if they ever get it — but the process is shorter when the government considers a new use for a therapy already deemed safe. “If there’s something there that already exists that could benefit patients, then we have the obligation to make sure we find it as quickly as possible,” said Dr. Todd Golub, a cancer specialist who works as Broad’s chief scientific officer and helped start the collection. So far, the Broad has acquired about 4,700 compounds from dozens of chemical companies that supply the world’s drug makers. Nearly 2,000 of those drugs were approved by the FDA or foreign drug regulators. Most were developed to treat infectious, neurological, and cardiological diseases. The compounds are stored in liquids or powders in tiny glass capsules labeled with bar codes. The capsules are lined up on shelves inside a giant freezer kept at minus-20 degrees Celsius. Robotic arms pluck them from the shelves for researchers to use in experiments. Some of the drugs were discovered a century ago or earlier, including benzocaine (a local anesthetic sometimes put in cough drops) and quinidine (a treatment for heart rhythm disorders). Others, such as apalutamide, are new, approved in February for prostate cancer. The collection took about two years and more than $1 million to assemble and catalog. It became available for research early last year, and continues to grow. The institute has also posted an index online, along with detailed summaries of the compounds, so outside scientists can have access to the information. Dozens of researchers from around the world have expressed interest in experimenting with the samples. The creation of the hub required scouring databases for drugs that never won approval, buying compounds, and then analyzing them to make sure the samples were pure. Broad researchers plan to test each compound on a variety of disease cells, including hundreds of strains of cancer at once. To do that, they will insert unique molecular “bar codes’’ — sequences of DNA — into each line of cancer cells and then pool the different lines. If the bar code disappears, scientists can infer that a particular drug might be effective against that form of cancer. “We’re not so smart as to know which ones will work, so we’ll test them all,” Golub said of the compounds. Among the cancer cell lines they plan to target is diffuse intrinsic pontine glioma, or DIPG, the fatal childhood disease that killed Sajni at the age of 9. 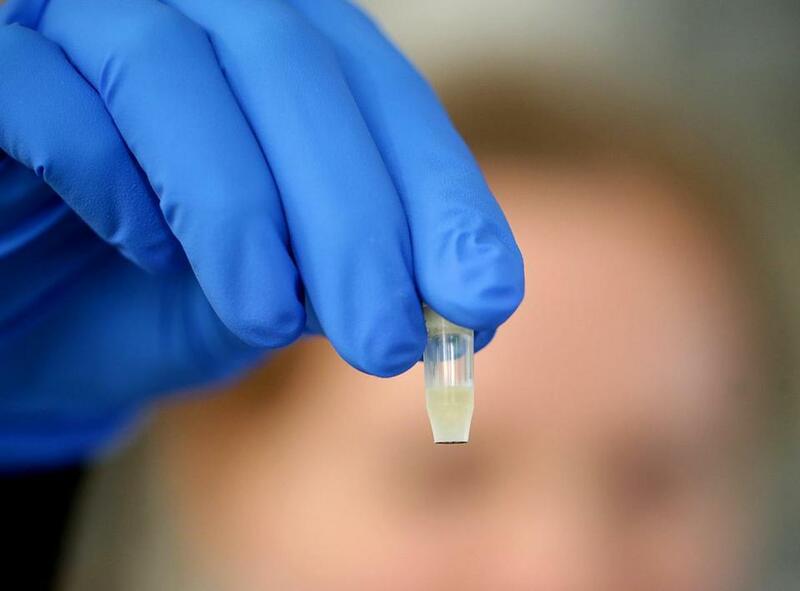 Dr. Mariella Filbin, a pediatric oncologist at Dana-Farber Cancer Institute and Boston Children’s Hospital who helped care for Sajni, said she and other researchers have grown 10 lines of DIPG cells in plastic flasks. The cells came from cancerous tissue samples taken from 10 children with the disease. 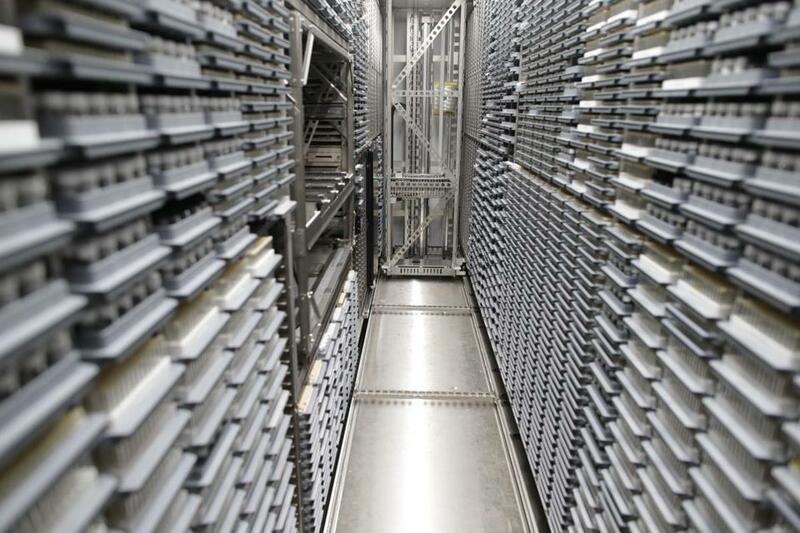 A freezer at the Broad Institute in Cambridge, where the vials of compounds are stored. Filbin said she couldn’t bring herself to treat children with DIPG if she wasn’t also searching for a potential drug that might combat it. DIPG tumors result from a genetic mutation and are very aggressive. They are found in the brain stem, which controls many of the body’s vital functions, such as breathing and heart rate. Although the holy grail for researchers at the Broad would be to find a drug that works on a rare disease that currently has no treatment, scientists there believe they’ve already identified old medicines that can help treat more common serious diseases. Dr. Steven Corsello, a Dana-Farber oncologist who helped assemble the collection, said he has found several drugs that appear to be useful in treating breast cancer and colorectal cancer. He hopes to publish his findings in a medical journal within a year. Even though finding an old drug that could treat a deadly disease would be much cheaper than developing a new one, the existence of the drug hub doesn’t eliminate all financial hurdles for Broad researchers. Screening the full collection to see if any of the drugs work on DIPG cells, for example, is expected to cost $800,000 to $1 million. 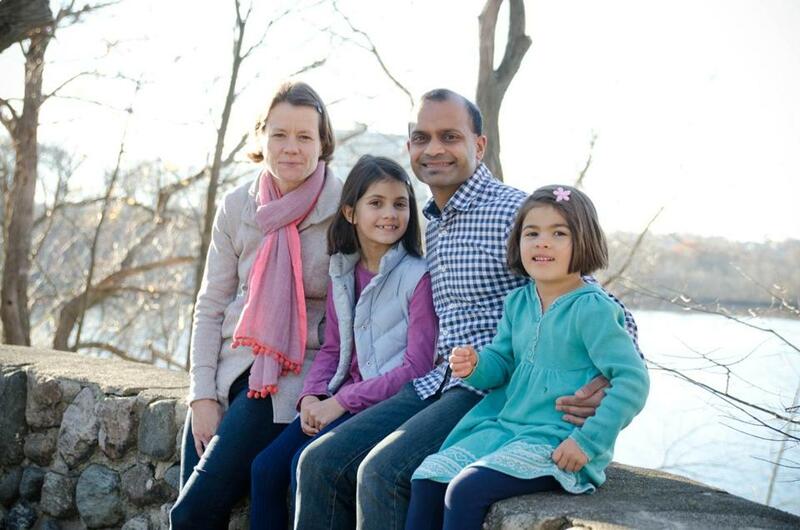 Sajni’s father and her mother, Vanessa Ruget, who teaches political science at Salem State University, are encouraging donations to a DIPG fund-raising campaign in Sajni’s name that the Broad has posted on its website. The couple — who took their daughter to England 10 times for an experimental treatment that they believe prolonged her life from the expected eight months after diagnosis to 19 months — said there would be no better way to honor her than to help find a medicine for the disease.